coming each week to get introduced to bird banding. nesting of birds across the street. moving around. Let’s hope the young start showing up the next two sessions. and an unusual emergence of feathers under the beak in the yellow warbler. Monday June 16, 2014. We had a very pleasant day weather wise Monday. Aggie Windig, Peggy Keller, Pat Lovallo, Meghan Oberkircher and Sue Smith Pagano from RIT were all there to help. Andrea stopped by to introduce me to Mindy Hettler, a new volunteer, who also stayed to see how we remove birds from nets, scribe and take nets down. She was not allowed to take birds out or handle them as I think she has to be trained first. She would like to bring her daughter the next few times to get her interested in banding. While checking the nets at 6 am, I was greeted by a deer face to face coming down and around a corner in the bushes at net #2. We both jumped sky high at the confrontation. At least she didn’t run into a net this time. This was the second deer confrontation of the morning. I hit a deer on Rt. 390 N on my way to the MAPS station at 5 am. It demolished my driver side front bumper, hood and air conditioning condenser. 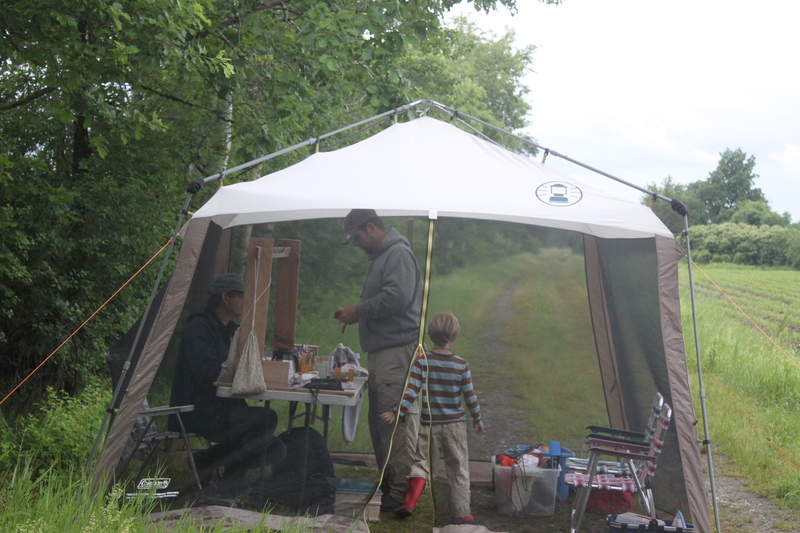 It was a very small crew with Henry and Brendan setting up nets and getting the banding tools ready for the day. It’s the smallest crew we ever had at Dead Creek. It was cloudy for most of the morning until almost closing time. Henry picked and scribed while Brendan and I banded and picked. Ryan got on the scoreboard for top bander. We banded 17 birds which is like our second slowest MAPS period. Our slowest was July 31,2009 when we had just 11 new birds and 23 retraps reprocessed. Bird of the day was Song Sparrow with 6 banded. 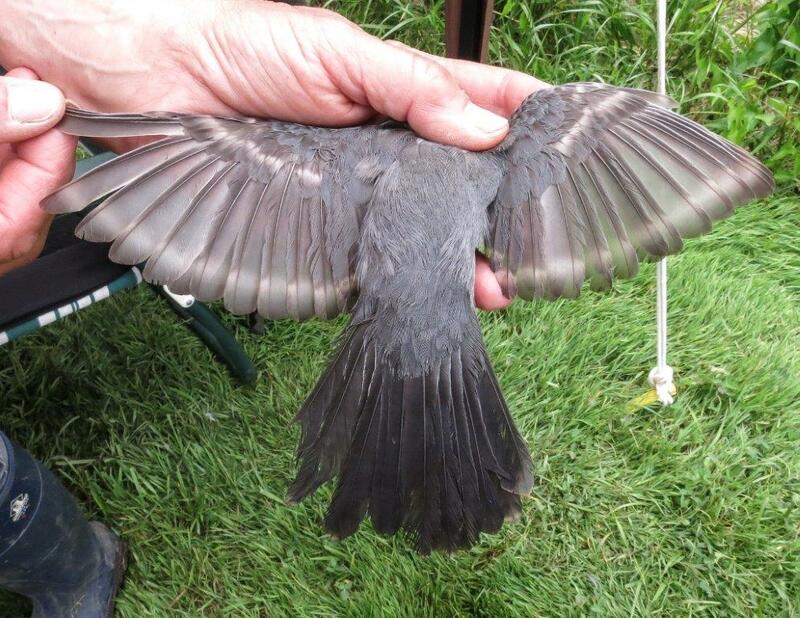 Only one Catbird was banded after the previous MAPS period we had 10 banded! Brendan’s son Quinn helped out some by releasing the birds. 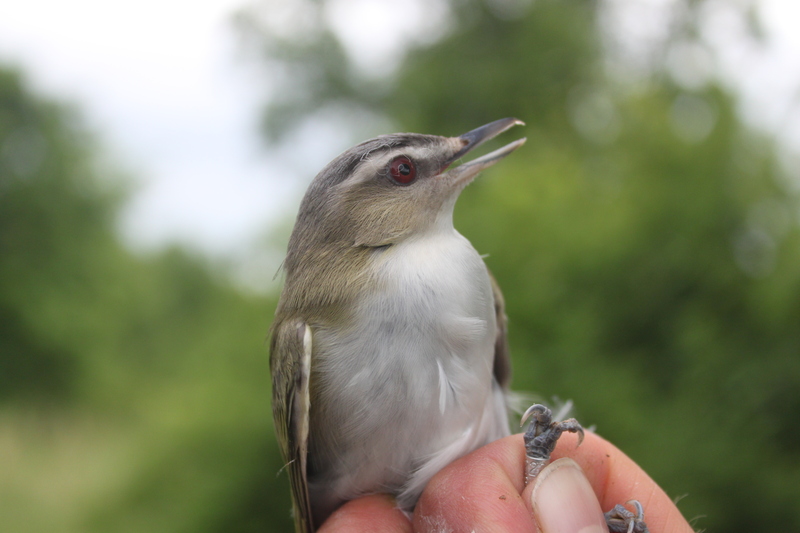 The highlight was our second Red-eyed Vireo in the 8 years we have been at Dead Creek. The last was one was banded June 17,2007 our first year at DCBO. Missing in action Rodney Olsen, Lisa Sausville, Ethan Sausville, Warren King, Claire Trombley, Becky Trombley and her famous Chocolate chip cookies! June 14, 2014 Despite an overcast and chilly morning, another successful MAPS session was completed at High Acres. We banded 27 new birds and had 16 recaptures for a total of 43 birds of 15 species. 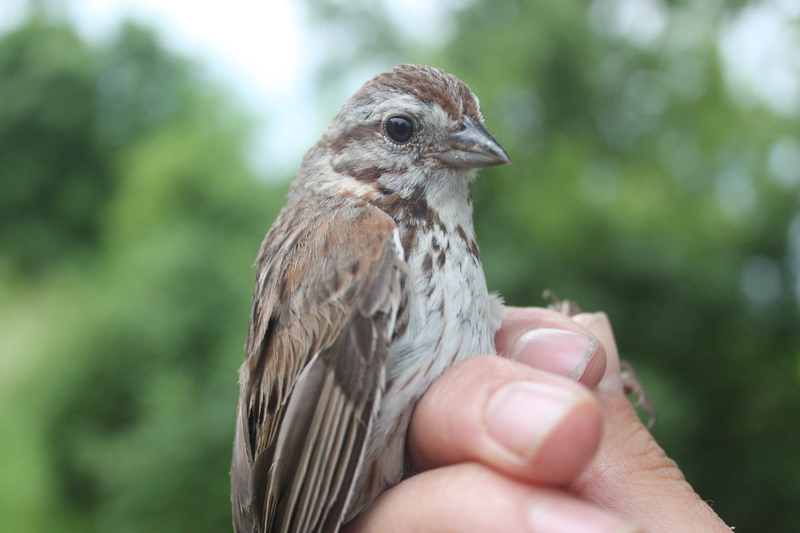 Birds have begun fledging, both a Wood Thrush and Yellow Warbler fledgling were banded. 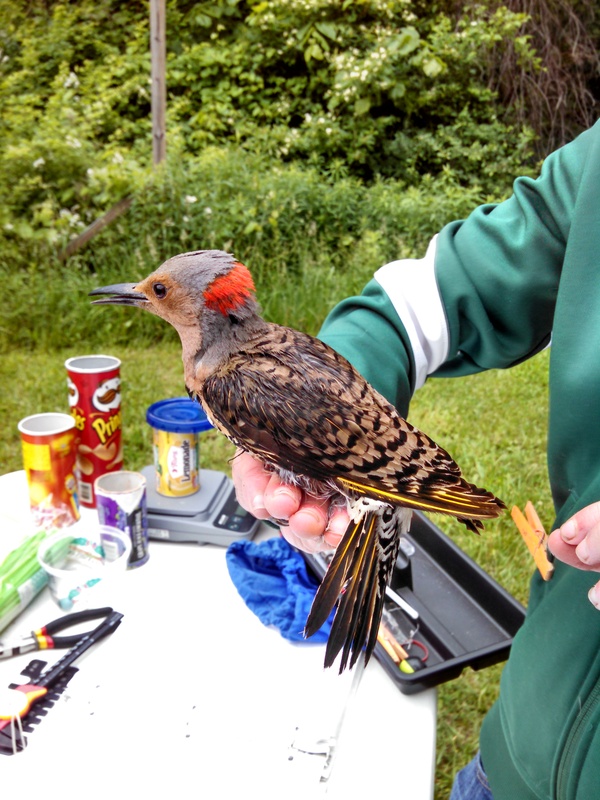 Similar to last week, the bird of the day came on the closing net run … an ATY Northern Flicker! 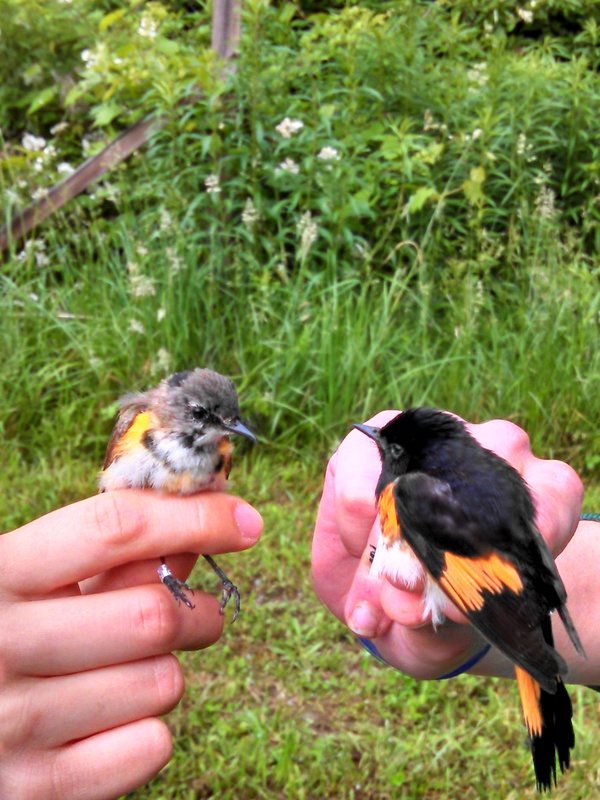 The first American Redstarts were also banded and gave us a nice comparison between SY and ASY male Redstarts. We had another good turnout of volunteers including many RIT alumni. Kaiser MAPS Station Up and Running for 2014 Season! brookser	Summer Banding	Comments Off on Kaiser MAPS Station Up and Running for 2014 Season! June 6, 2014. We banded 26 new birds and 13 retraps. Meghan Oberkircher is taking blood samples for her master’s work at RIT on stress related hormones and chemicals, concentrating on Song sparrows, Catbirds and Yellow warblers. She has lots of experience at the HANA station and will be a big help. Cindy Marino gave me a hand and Pat Lovallo dropped by to help after doing a little painting of a closet at the house. We had a beautiful day to work and I am happy to say I am glad I decided to continue the MAPS station for another year. I used six brand new nets and repaired two old ones to use at my station. Unfortunately, a deer ran right through a new net within on hour of my opening it up. It took me 2 1/2 hours to repair the 3 foot hole it put into the net. I had to stitch in a section from an old net just to fix it. There are many many deer in the area. At least there were no bear sightings. Summer MAPS banding started out at High Acres Nature Reserve with 26 newly banded birds and 12 recaptures. There was a good mix of birds of 13 different species including several Carolina Wrens and bright Yellow Warblers. The highlight of the day came during the final net run; a surprise tree swallow! This species had never been banded at HANA before, although they are seen all over the site. Thank you to the seven volunteers who came out to help for the first session, the help was greatly appreciated! Final Day of Spring 2014 Banding! brookser	Spring Banding	Comments Off on Final Day of Spring 2014 Banding! Wednesday June 4, 2014. 34 new of 22 species; 4 retraps. Our total today was 34 with no species being a big winner. All 22 species were pretty equally represented. The four recaps today gave us a total of 617 for the spring season. 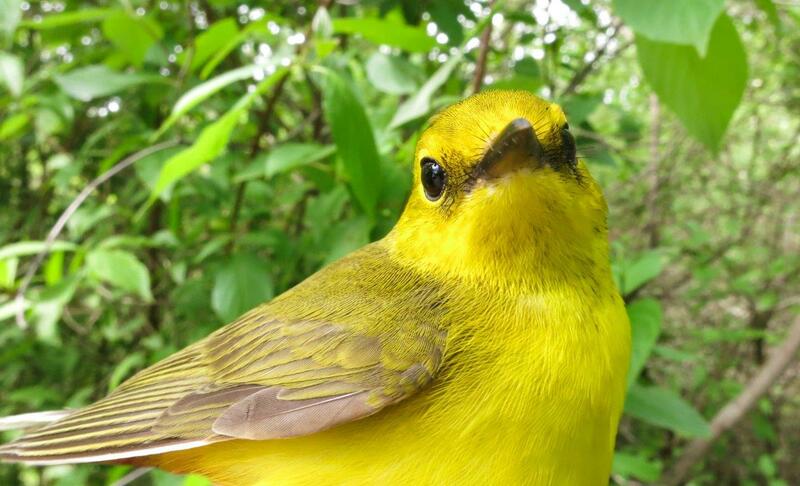 The total number of birds banded this spring to this date was 3783. We had enough birds to keep the five banders happy! Our local photographer, Kathy Habgood, told us about her experience of getting some great photos of the Kirtland’s Warbler. Thanks to John B for keeping us focused as he scribed for us and Alice V for keeping the net-pickers in order.